The documenta Archive is the main lender to a major exhibition on the history of documenta, with stops in Beijing and Shanghai. Curators Prof. Klaus Siebenhaar and Mona Stehle. 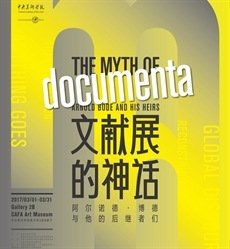 In cooperation with the Institute for Arts and Media Management of the Free University of Berlin and the Institute for Art Administration and Education of the Central Academy of Fine Arts (CAFA) in Beijing, the exhibition »The Myth of documenta: Arnold Bode and his Heirs« is on view at the CAFA Art Museum, Beijing from March 1–31, 2017 and includes over 600 items displayed within a space encompassing 1,500 sq m. A selection of the items will then be shown in the exhibition »Arnold Bode and documenta« at the New Gallery of Art in Shanghai through the end of June.